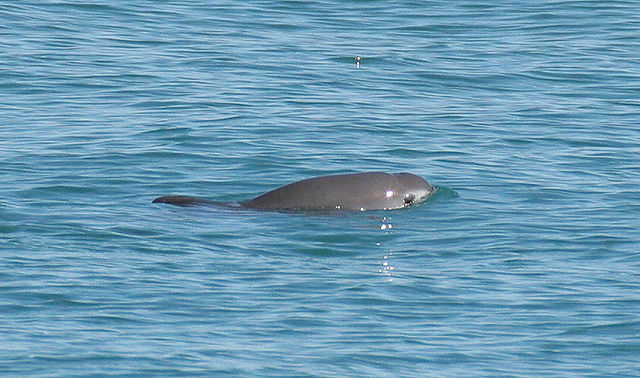 (CN) – Using U.S. Navy-trained dolphins, Mexican authorities will try to round up and capture some of the nearly extinct vaquita porpoise – the smallest and rarest kind of porpoise. There are fewer than 30 vaquita porpoises left in the northern Gulf of California, and scientists say their population has declined by 90 percent in the last five years. While not generally hunted, the decline in population is partly due to gillnet fishing in the vaquita’s habitat. Gillnet fishers in the upper part of the gulf often seek the totoaba, whose bladder is in high demand for use in Chinese traditional medicine. The Mexican government has invested millions into protecting the vaquita porpoise, and earlier this year President Enrique Peña Nieto agreed to permanently ban gillnet fishing and strengthen enforcement of the ban. Mexican billionaire Carlos Slim and actor Leonardo DiCaprio both signed on to the agreement, with the their respective foundations committing to a strategy to save the vaquita. Conservation groups have been among those putting pressure on the Mexican government. Their efforts have included petitioning the U.S. National Marine Fisheries Service to ban the import of seafood caught with gillnets in the vaquita’s habitat. The U.S. Navy has used bottlenose dolphins for decades to help locate objects underwater. Officials hope the dolphins will help them round up vaquitas safely. If the capture is successful, there are still remaining questions about whether vaquita will be able to breed in captivity. While larger marine mammals like dolphins can thrive in captivity, porpoises are more sensitive to noise and have higher heart rates, experts say. “We think of them as the hummingbirds of the marine mammal world,” Frances Gulland of the Marine Mammal Center told Science Magazine last year.